Entomologist May Berenbaum is here today to take our questions about bees, their recent decline, and what we can expect from our pollinators in the future. Berenbaum heads the Entomology department at the University of Illinois at Urbana-Champaign, where she is both a professor and a chair of entomology. In addition to looking at our dwindling pollinator populations, her research has also focused on the tangled relationships between insects and host-plants. She chaired the Committee on the Status of Pollinators in North America for the National Research Council and she'll be taking over as the president of the Entomological Society of America in 2016. Berenbaum has written a number of books on insects and she is also the founder of the Insect Fear Film Festival, which showcases the strange (and usually very scientifically implausible) collection of giant bugs, swarms, and assorted insect anomalies that have appeared on the big screen over the years. She'll be joining us today from 10:00 - 11 :00 a.m. (Pacific time). So start asking her questions now about insect behavior, the hold of insects on our imaginations, and what the future holds for our bee colonies. 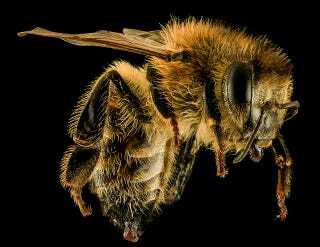 Image: The Honey bee, Apis mellifera by Sam Droege / USGS Bee Inventory and Monitoring Lab.